Richly accented with vintage artwork from an authentic 1860's U.S. map, this collector series custom throw is an extraordinary celebration of America's early heritage. The exclusive nature and bold 48" x 60" size make this an ideal gift - especially for die-hard western fans. Coupled with a multi-colored fringe border, the original design of the throw makes it equally impressive as a decorative wall-hanging. Rare images shown include three Studebaker western vehicles dating from the 1870's and 1880's. The trio of farm, ranch and military transports were chosen to commemorate Studebaker's rich history while also pointing to the fascinating legacy and thriving spirit of the Old West. 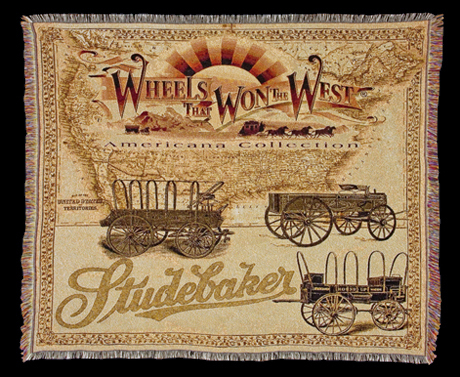 An heirloom-quality intricately woven keepsake, this Wheels That Won The West® custom throw is made of 100% cotton. The ultra-weave design is machine washable, preshrunk, color fast and makes a distinctive addition to any western décor. Enjoy the engaging looks and warm, comfortable feel of cotton in this unique tribute to one of the most significant names in early American transportation. $125 plus U.S. s/h. Proudly made in the USA.